Cricket has a unique tendency to modify itself over the course of time, getting better and more competitive in the process. The Gentleman's game has stood the test of time for over 140 years on an international scale. These 14 decades have brought out a ton of changes on the plate, which in turn have presented a lot of challenges and rolled out unique situations garnished with a pinch of uncertainty. This uncertainty has brought out a whole new edge to the game and has resulted in certain rare situations. The sight of a wicket-keeper running towards the pitch by the umpire's side while gripping the ball and scalping a wicket is one such rare happening. The role of a wicket-keeper has incurred several changes with time. Unlike in the past, a wicket-keeper's job is not only limited to keeping wickets but also to deliver the bat. Legendary wicket-keepers like Mark Boucher, Andy Flower, Kumar Sangakkara, and Adam Gilchrist performed the dual responsibilities for their respective sides to perfection. For any Marvel movies fans out there, uncertainty is an infinity stone in the realm of cricket. This is best reflected in certain instances where a wicket-keeper tripled up with his contribution by rotating his arm and providing a crucial break-through. In this little web-piece, we will take a look at top five instances across all formats in international cricket where a wicket-keeper came to the rescue with the ball. The legendary South African wicket-keeper served his nation for over a decade and is well respected in the world of cricket. In 2005, South Africa was playing a test match against West Indies in Antigua where both registered massive scores of 588 and 747 respectively on the board. 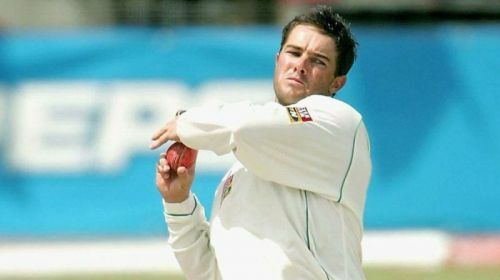 The match was headed for a slow draw when Mark Boucher was given the ball. A particular delivery that Boucher bowled at an accurate length and slow pace, rewarded him with an important wicket of Dwayne Bravo. He was batting on 107 and was well-set on the crease but a good delivery by Boucher carried the ball to Ashwell Prince who caught it easily. His bowling figures were 1.2-0-6-1. It was his only test wicket and incidentally, it came on the last delivery bowled by him in his glorious 147-match Test cricket career. Goodness Gracious!